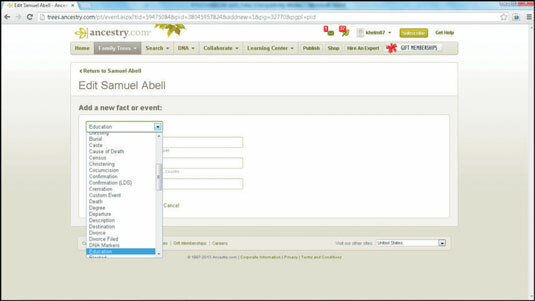 1If your family tree isn't onscreen, place the mouse cursor over the Family Trees button at the top of the Ancestry.com home page. A secondary menu drops down showing the family tree you created. Click the family tree name to display your family tree. 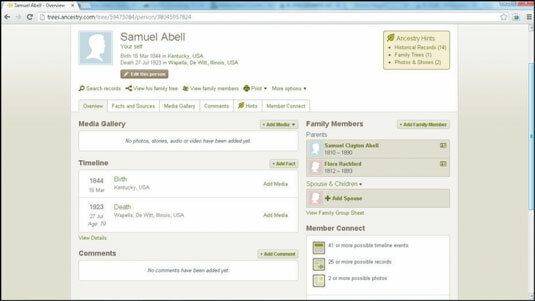 Your family tree is displayed with the Pedigree view. 2Place the mouse cursor over the name of a person on your family tree. A pop-over box appears with more information about the person on your family tree. Several tabs are available on the Profile screen: Overview, Facts and Sources, Media Gallery, Comments, Hints, and Member Connect. As you might expect, the Overview tab, shows a summary of the information contained within the other sections. 4Click the Facts and Sources tab. The new page contains some basic facts that you already entered, such as gender, birth, and death. 5Click the Add a Fact button on the right side of the green menu bar. The Add a New Fact or Event page appears. 6Click the Add a New Fact or Event drop-down box and select an event. One or more fields appear on the page depending on the event that you selected. 7Fill out the fields and click Submit. The information that you entered now appears on the Facts and Sources tab.